Are you located in the Friendswood area and are looking for a reliable and affordable tile and grout floor cleaning company? Modern Stone Care is here for you to take away your deep, impacted, set-in dark stains. We understand even when you give your floors regular attention, through at home maintenance, your grout lines still may become dark and unpleasant to look at. You do not have to look at your filthy, unsightly grout lines any longer, call Modern Stone Care instead! We are the Houston experts when it comes to restoring flooring and making it look as good as new! Get the floors you loved back, with Modern Stone Care! 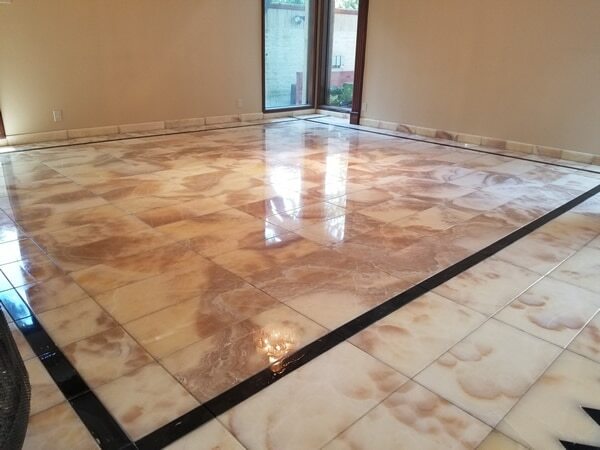 Lots of people think when their grout has been neglected for a long time their only options to get rid of the grimey black lines is to either relay your floors, or paint over the grout lines. Both of these options have a major downside. Whenever you relay your floors and grout, it is an expensive and time-consuming process. Whenever you choose to paint over blackened, dirt grout lines you are choosing to keep the grime. This can result in mold and rarely looks right. Additionally, whenever the paint starts to chip, which it will, you will have dirty spots poking through. The best option is to go with our excellent restoration services! We can leave your floors looking amazing for drastically less than the cost to replace your flooring. Modern Stone Care is an insured, certified natural stone restoration, and tile cleaning company. We have been providing our services to the Greater Houston area, including Friendswood, TX, since 2009. We have always maintained an excellent reputation throughout the communities we service as a hardworking and reliable floor maintenance company. Do not live with unsightly grout line, trust the experts at Modern Stone Care!